We made a last minute reservation begining of the week for a quiet getaway and we had a TrueType spectacular time! The staff were so helpful and really looked after us. They made a special effort to cater to our every need. The food was delicious - I'm Vegan and they even made a special vegan set menu for me daily! It was the most delicious vegan food I had ever had in Sri Lanka- ranging from risotto to ravioli! The rooms are private and very comfortable and the pool was so relaxing. I had a full body massage one afternoon which was very good and not too expensive. All in all a fantastic villa and we will definite be coming back. This is one of those reviews that you almost don't want to write cause you really want to keep this place all to your self. However that would not be fair to Rock Villa as it is the most wonderful little place. 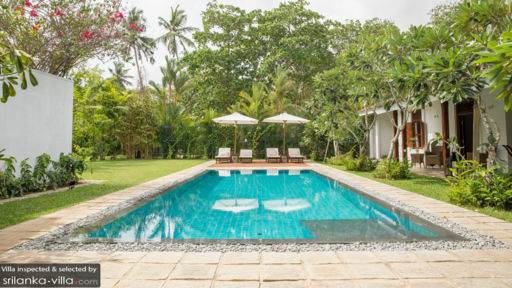 It is a little less than a 2 hour drive from Colombo airport. We took a taxi there using one of the taxi companies from the arrival hall in the airport (as recommended on trip adviser, no need to book in advance). With only 6 rooms you enter a garden of tranquility. The rooms are very cute and the hotel grounds are beautiful. Its a three minute walk to the beach where you have to cross the railway tracks. You can hear the trains from the property but we actually found that to be a bit charming. The beach is great for jumping into the ocean with semi strong current and pink sunsets. The restaurant is out of this world!!! It can take up to an hour before you actually get your food so go well in advance but it is all worth the wait. Everything is homemade and delicious. The seafood, the curries, the breakfast and their ice cream. The food and drink prices are very reasonable. We hope to be back as soon as possible! In short, it rocks! This really is one of the best places we've ever stayed. Dalal and her team are so professional and welcoming. They somehow make you feel as though you've got the whole place to yourselves: the perfect blend of attentive service and knowing when to let you have your own space. There were so many lovely little touches (fresh flowers from the grounds dotted around the place, free tea and coffee, great music playing in the restaurant). The whole property is a picture perfect tropical paradise. The food was exceptional (in particular, the homemade coconut ice cream) and the original cocktail creations went down a treat (get yourself a Rampe Pampe)! The beautiful Bentota Beach is a quick stroll from the back of the property, where the sunsets are truly stunning. We visited a few of the beaches on the southern and western coasts of the island and this stretch was undoubtedly the most serene. An absolute must do is a visit to the Kosgoda Sea Turtle Conservation Project, which is a short drive down the coast by tuk tuk. The chance to release tiny baby turtles into the ocean at sunset will be a highlight of your trip to Sri Lanka. Just make sure you end up at the right turtle hatchery; Google the place in Kosgoda run by Dudley. Overall, Rock Villa allows for total relaxation in the perfect setting. We'll be back! Taru Rock Villas is one of these places you would like to return in a heartbeat. The villa’s grounds are just stunning and filled with a flair you won’t forget. We had one of our nicest meals at Taru’s – the cook does a fantastic job there. We loved every single minute of our stay and hope to come back soon. Many thanks for a fantastic stay – you guys really do a fantastic job! What a place! Had a short stay with the family at this beautiful place and we were spoiled not only by the stunning villa, the fantastic garden that invited us to play, the pool that kept us cool under the sun, the well kept beach and the gourmet food, we were more than anything spoiled by the excellent but descreat service. In summary we shouldn't write this review as others will get inspired making our next booking a challenge... Thanks for making a short stay so memorable.